A Green Machine, fished wet, accounted for three salmon in 30 minutes this October day. Following on the heels of last week's post, this week's post is about my favorite fly for each month of the fall, plus a bonus winter and spring fly. I like tying almost as much as fishing, so it is difficult for me to narrow it down to one fly for each month, but I will do my best. 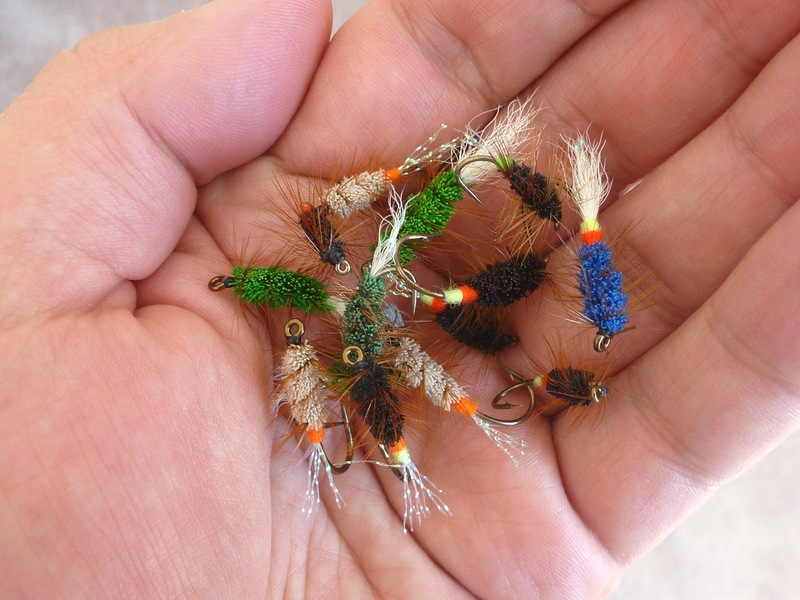 Since fly selection is dependent on conditions, try not to think of these as the best flies to use as much as they're flies to always have on hand. September: My fly of choice is an unusual one for an unusual month. I have only experienced broodstock salmon fishing in one September (2013), but it was a great month. As expected, the water was low and relatively warm. As such, any angler would expect small flies to work well under those conditions. They did, but a surprising revelation was that a small German Snaelda, tied on a heavy brass tube, worked like a charm when the salmon wouldn't rise for the usual stuff. Since the fish were holding in the fastest water, a heavy tube fly got through the chop quickly and I hooked several salmon on the Snaelda that September. Actually, I got my clocked cleaned by one that took off like a banshee and cartwheeled all over the pool. It was one of three fish hooked on the tube fly that afternoon. Though I would always try a small wet fly first, I wouldn't be without the German Snaelda in very early season fishing. October: It's a tough call, but I have to choose a Buck Bug, which is the most versatile fly of them all. Tied with a body of spun deer hair, a Buck Bug can be fished like a traditional wet fly, fished with the riffling hitch, or greased and fished as a dry fly. My favorite is the Green Machine with a white tail. If you tie your own flies, make sure you don't pack the deer hair too tightly. November: Now it's time for the king of all broodstock salmon flies, the Mickey Finn. Really, there is no bad time to fish a Mickey Finn. I could have made it fly of choice from September through December, but that wouldn't be much fun. I have had success on Mickey Finns from size 2 down to size 14. My favorite sizes are 6 and 4, particularly the latter for fishing in November. I like to tie it with a couple minor variations. I use a flat braid for the body. I find it holds up better than flat tinsel because it shreds rather than breaks. Sometimes I use regular red bucktail and red Krystal Flash, other times I use fluorescent red bucktail without Krystal Flash. I am particularly fond of the fluorescent red variation. It's almost a magenta color. When in doubt, use a Mickey Finn. December: Early December is a great time to target big salmon. Without a doubt, my favorite fly for these big brutes is the Willie Gunn, tied with a gold body. 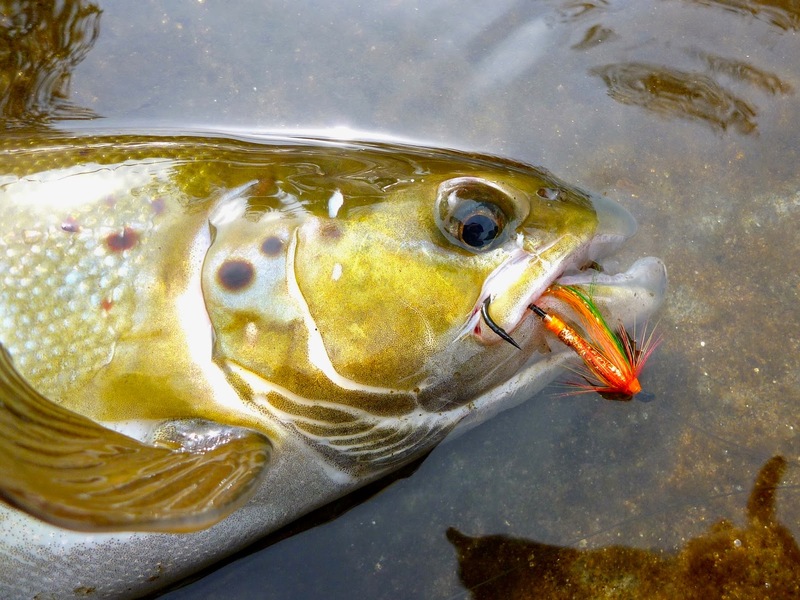 In late November and early December, large fish might still be holding near the heavy current. Tied on a copper tube, this fly gets down fast. 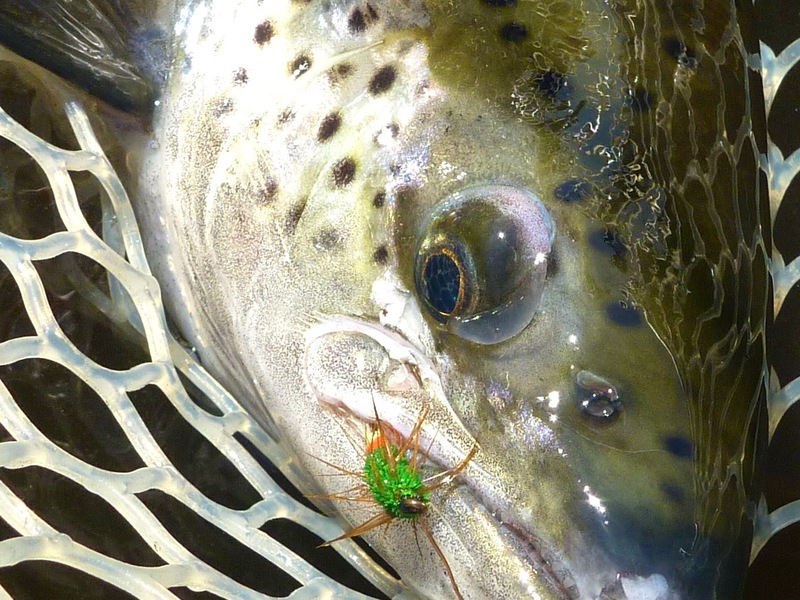 A sinking tip or line helps keep the fly down. It is an aggressive presentation, but it often times effective. One of the largest broodstock salmon I've ever landed took a gold Willie Gunn, one of three fish on that fly that December day. 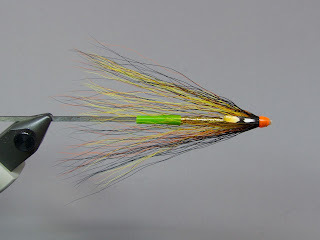 It is a very easy fly to tie and a good one for those learning to tie tube flies. Winter (January-March): This time of year is all sunk line work with a slow, mobile, aluminum tube fly. What is more mobile than marabou? The lethargic winter fish usually follow a fly from behind and nip at its rear end. Because of this, I like to use an exceptionally long piece of junction tube with the hook extending beyond the back end of the marabou. It helps to hook the "nippers". Other color combinations work well, but I have caught most of my salmon with the Grape. Any big, fluffy fly should work, but keep that hook way back. 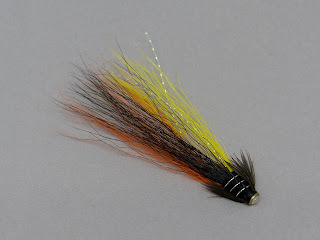 Spring: Now it's time for my all-time favorite salmon fly, the Sugerman Shrimp. Honestly, I've had plenty of luck with it in all months. I like a big size 2 or 4 Sugerman when the water is cold, but the air is warm, fished on a floating line. The largest broodstock salmon I've ever hooked took a big Sugerman Shrimp variation. Like the Grape, it's mobile, but the fish will nail it with more authority in the spring, so there is no need for a hook set way in the back. In the spring, the salmon are hungry and a big Sugerman Shrimp looks like a yummy meal. It is definitely one not to be without. Hopefully this gives you some non-Mickey Finn options, even though the Mickey Finn is as good as any and better than most. 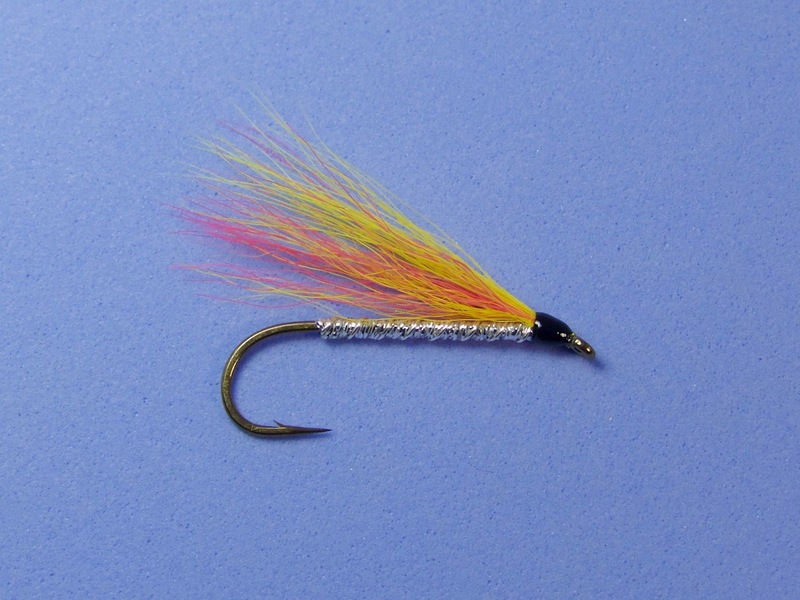 Most eastern fly fishers are intimately familiar with this iconic bucktail pattern. The rest of the flies might not be as familiar, especially those tied on tubes. There's no reason to be scared off. 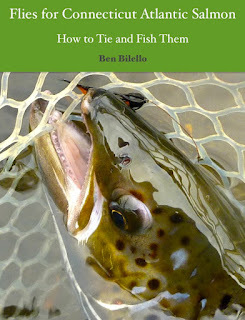 All these flies, and many more, can be found in my ebook "Flies for Connecticut Atlantic Salmon: How to Tie and Fish Them," available for both Apple iOS devices and in universal PDF form. 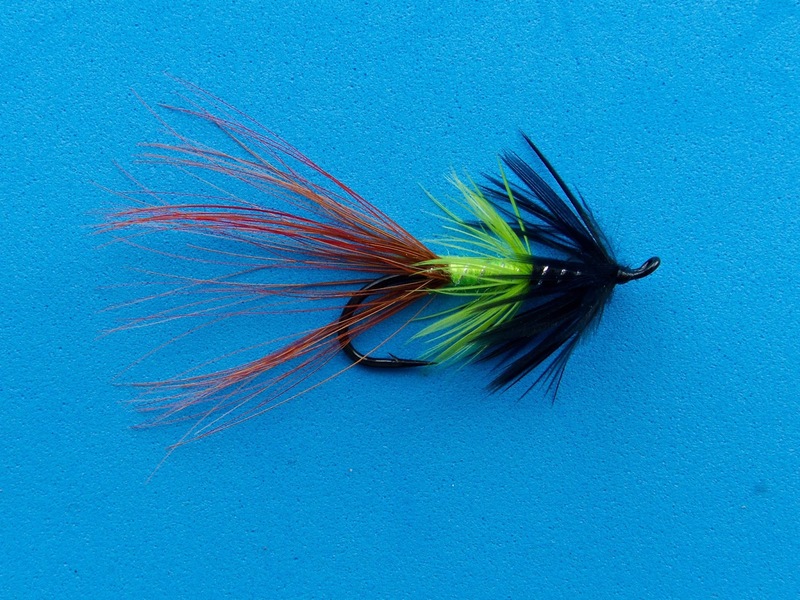 Get tying, fall is almost here! Exploring a Different Type of "Blue Line"